Have you ever tried Acupressure points for weight loss? Well, I’m sure not many of you have at least heard that it is possible to burn fat by using Acupressure or Acupuncture techniques. Don’t worry! In this article, I’ll be explaining everything in detail about the concept with a little science. The concept of Acupressure involves the flow of life energy through ‘meridians’ in our body. When it comes to the Acupressure treatment, physical pressure is applied on the pressure points (selective areas of our body) with the aim of getting relieved from the pain (problem). You may use hand, elbow or various devices with soft edges for applying pressure. Several researches have proved that you can relieve yourself from nausea, vomiting, lower back pain, headaches, stomach aches and many more health problems. The list doesn’t end there, as you’ll also be able to lose weight through Acupressure techniques. That’s right! by following the 7 day GM diet plan. by replacing your lifestyle with Intermittent fasting routine. by performing this simple 7 minute HIIT workout daily. last but not the least, using Acupressure techniques to lose weight. You can lose weight easily by applying little pressure on the selected energy points on your body. It will improve your digestive system which will in turn help you control your appetite (hunger). The Acupressure weight loss techniques should be followed/practiced on a daily basis for at least 30 minutes to achieve better results. P.S: It is advised to lightly massage the area (suggested meridian) both before and after applying the pressure. Body massages help in improving the functionality of your digestive system as well decreasing your appetite or food cravings, thus making you lose weight for good. By following the below Acupressure techniques, the life energy will flow through all the organs, mainly the spleen meridians and the stomach. Also, ensure that you need to apply the pressure on these points. 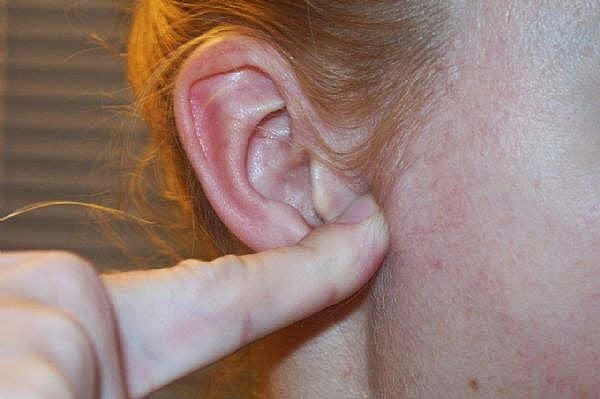 This particular point in your ear helps in controlling your appetite. Simply, place your thumb against the jaw of your ear and move it up and down. While doing so, you’ll be able to locate the point where there is maximum movement. Once you’ve found it, stop your finger there and press the point for at least a minute. You can find this particular point in your abdomen region exactly 3cm down from the belly button. In the below figure, you can clearly see the ‘Ren 6‘ mark, which is called as the Abdomen point. This special point improves the function of your digestive system as well as to reduce constipation, which is why it is one of the best acupuncture points to lose weight. All you need to do is to place your two fingers on the point (Ren 6) and massage the area with up-down motion for at least a minute and then press the point for another 2 minutes. Doing this routine twice a day will give you better weight loss results. This point, which is located under the last rib helps in relieving from ulcers, indigestion and rib pain. It also balances your appetite so that you don’t get food cravings more often. You’ll need to press this abdominal sorrow point for at least 5 minutes everyday in order to achieve the best results. On the inner side of your elbow crease, you’ll find the large intestine point which is located towards the end. 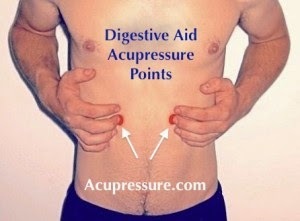 This acupressure point helps in stimulating the function of your intestine. It simply removes excess body heat and unwanted moisture that is present in your body. Use your thumb and press this elbow point, at least for a minute every day to achieve better weight loss results. This acupressure point improves your digestion and helps in smooth functioning of your stomach. You can find the knee point on the outer side of your leg (left or right) just 2 inches below the knee cap. Using your forefinger, apply the pressure on this point for at least 1 minute. After the minute was completed, with your finger on the pressure point, move your foot up and down and you’ll feel the movement of your muscle. That is the perfect spot! By staying in that position, press the point for another 2 minutes. This acupressure point is basically meant for the spleen, but it also helps in strengthening your digestive system. 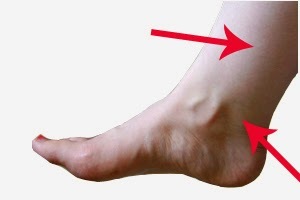 You can find this ankle point just 2 inches above your ankle, on the inner of your leg (left and right). By pressing this point regularly, you can improve the function of your digestive system. Press this point for at least a minute everyday to lose weight effectively. That’s all Friends! By following these acupressure techniques regularly, you’ll be able to improve or balance your digestive system and at the same time control your appetite. So simple, isn’t it! What are you waiting for? Start immediately with these six best acupressure points for weight loss.